Rose Ann Fennessy-Murphy is the kind of person that makes trips to the local library anywhere she vacations. When her family moved to Omaha from Fort Dodge, Iowa, she walked to Benson Branch from her childhood home or got rides there from her father. In 1995, Fennessy-Murphy was convinced to apply for a part-time position as a library aide by a librarian at W. Dale Clark Main Libraryopens a new window. “I loved libraries and spent a lot of time in them, so when I considered the idea that they would pay me actual money to work in one I said, ‘Sign me up,’” said Fennessy-Murphy. In 1997, Fennessy-Murphy took the exam to become a library specialist and was hired by OPL full time. Over the last 23 years, she has worked at various OPL branches. 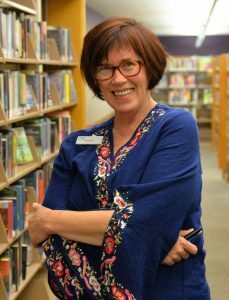 After taking a one-year leave of absence to live in London, she returned to Omaha and took a position at Millard Branchopens a new window, where she has worked for the past 12 years maintaining the branch's adult fiction collection, the second largest of all OPL branches'. She also connects patrons with books that they’re interested in reading. Few people could do her job better, according to Lois Imig, former Millard Branch manager. “Rose is a walking encyclopedia of book information. She remembers everything she’s read,” said Imig. Two things Fennessy-Murphy is adamant about are that nobody should ever apologize for their reading tastes and that everyone she helps should leave the library with at least two or three books, in case they don’t enjoy the first one they try. “Life’s too short, so that’s why I like them to leave with several options,” said Fennessy-Murphy.